The Jade Plant is used in Feng Shui to attract the flow of money. The ancient Chinese assocate jade with the wealth of emeralds. 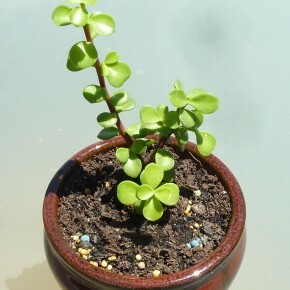 The round leaves of the Jade Plants resemble coins, giving rise to the name Money Plant. The owner’s fortunes are believed to increase with each new leaf. As a symbol of prosperity, it makes a perfect housewarming gift or for a new business or marriage. Jades are also a perfect present for a friend. If a Jade flowers, it reflects well on the owner and symbolises great friendship, luck and prosperity. The green leaves signify energy and the joy of friendship and the flowers represent the fragrance of great friendship.